Each year, the O’More Designer Show House honors leaders in interior design, many of whom are O’More alumni who have honed their skills since graduating from the small design school in Franklin. “Because the majority of the designers who participate in the Show House are alumni, the event is a tremendous demonstration of the world-class design education that O’More delivers,” says O’More President Shari Fox. “Each space will be expertly designed and provide guests with inspiration for their own spaces.” While the event centers around those who have previously attended the school, it is in fact designed to benefit those still enrolled. Proceeds of the event benefit the School of Interior Design within O’More College of Design to provide scholarships, improved facilities and the latest technology for the students. Let’s take a look inside this beautiful home! The first spaces you see in the O’More Designer Show House are designed by Kate Ladd with Vernacular and Minnette Jackson with Minnette Jackson Interiors. Should you choose to enter through the home’s front door — as most guests do — you will be welcomed into the foyer designed by Kate. Three vases hang along the wall and bring the natural beauty of the home’s surroundings indoors. Friends and family are likely to enter through the back entrance, which leads to the home’s gallery. Minnette chose a collection of figure paintings to anchor the space, which leads to the utilities room, first-floor powder room, outdoor living space and kitchen. Outside the main entry and foyer, you will see the courtyard and front porch designed by Elaina Siren and Jamaica Zralek of Red Leaf Interiors. Find these beauties in the foyer. The gallery features a collection of figure paintings hung against textured wallpaper. This space is beautiful from every angle. Even the more traditionally functional spaces on the first level are expertly designed. Susan Lamb of Parkes & Lamb Interiors made the first-floor powder room fashionable and functional, while Susan Besser of Franklin Preservation Associates and Corey Morris of C. Morris Studio tackled the utility room, or the “Do All” room, as it’s called. Corey describes his design as “eclectic traditional.” “The overall style of the home has a nice mix of traditional and contemporary elements, so I played off of that balance in the utility room,” he shares. He juxtaposed contemporary finishes and cabinetry with traditional pieces, offering a nice harmony. The standout feature of the space is the custom concrete lamp he created specifically for this room. “Drawing inspiration from classic topiary shapes, it really grounds the underlying nature tone of the utility room,” he says of the lamp. The room presented a challenge in that Corey wanted to make it as beautiful as it was functional, and we think he succeeded! Corey created this lamp specifically for the space. Randi Stovesand with Tanley Blake Interiors sought to bring sophistication to the kitchen and scullery. “I believe it is a very handsome kitchen with the focal being the waterfall quartz edge on the island. The custom cabinetry in a darker finish with aged bronze accents give it a touch of masculinity,” he tells us. The artful design demonstrates the ability to marry different textures. Between the quartz countertop, bronze accents, wooden counter stools, backsplash and textured work of art, the room offers many focal points that don’t compete but rather complement each other. The scullery is no different — penny tile, open shelving, glossy cabinetry and tiled flooring bring so much character to the space. Find sophistication in the kitchen! Note the stunning garden panel from the Bunny Williams Home Collection. The waterfall quartz countertop is one of our favorite features of the space. We are particularly fond of these floors. Adjacent to the kitchen, the dining room offers a similar air of sophistication and style with a more formal approach. Jonathan Savage of SAVAGE Interior Design chose drapery that is rich in material and color to frame the windows, which overlook the courtyard. The blues and golds found in the fabric, and the blue rug, are some of the only shades of color in the space. Upholstered chairs and a cream wooden dining table allow the accents and art to standout. Jonathan Savage did a spectacular job in the dining room. This work of art brings elegance to the space, and the formal drapery as a backdrop only enhances its beauty. The kitchen opens into the family room (arguably the most important room in a home). Designed by Amy Morris of the Atlanta-based Amy Morris Interiors, the family room is the heart of this house. “I feel that this space is a modern interpretation of a family room, being both elegant and comfortable,” Amy shares. 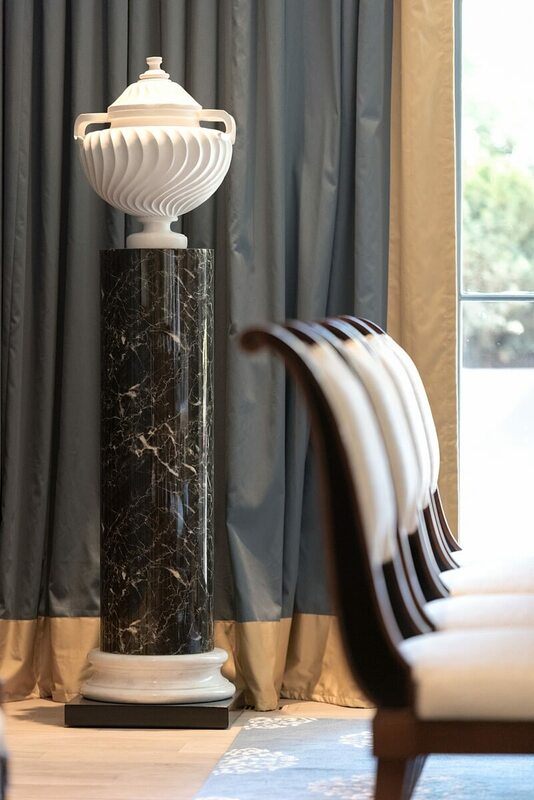 “The house has a modern transitional feel, so we mirrored that by introducing antique pieces with modern elements, which I often display in my work.” With this being the only living space in the home, Amy was challenged with making it suitable for everyday living and entertaining. “By mixing comfortable upholstery with sophisticated accent pieces, we created a versatile room that served both purposes,” she says. Space for living and entertaining extends into the home’s screened porch, designed by Bob Brown of Robert Brown Interior Design. Large windows flood the space with natural light and allow the home’s visitors to experience the beauty of the O’More Designer Show House’s surroundings. This coffee table is unlike anything we have seen before! This piece celebrates the neighborhood’s natural beauty. Bob Brown designed a screened porch that is rich in colors and textures. The firewood doubles as a wall for art. This custom headboard is the focal point of the first-floor guest room. The guest room also features a sitting area — of course, it is perfectly styled. The guest bathroom features clean, contemporary finishes. The shelves, art and wallpaper are all OK in our book. We are coveting this book collection! The work of Evan Gibbs, with Pfeffer Torode Architecture, sets the tone for the second story. Her design work in the landing and upstairs foyer is spectacular. The master bedroom is the must-see room in the home. With windows that make you feel as if you are perched among the treetops, this room best ties in the home’s surrounding and architecture with the designers’ work. Lila Frank of Lila Pryor Frank Interiors designed the vestibule and master bedroom in style du jour. Soft tones and neutral colors take a backseat to eye-catching furniture and art. The hallmark of her design is the bed frame that is considerable in size and a true work of art. In fact, the room is filled with art. This bed steals the show! Even the art and accent pieces evoke the beauty of the outdoors. You won’t believe the light and the views. This a space you must see for yourself. The practical spaces upstairs were not forgotten. O’More fashion students were responsible for the his-and-hers closet, while Kathy Sandler of Sandler Design Group tackled the upstairs laundry room, coffee station, master bathroom and hallway. Find a sense of calm in this beautiful chair! The O’More Designer Show House will be open to the public from October 19 through November 12, 2017. Show hours are Wednesday through Saturday, 10 a.m. to 4 p.m.; Sundays, noon to 4 p.m. The Show House will be closed on Mondays and Tuesdays for private groups. Tickets are $20. For more information and to purchase tickets, visit omoreshowhouse.com. All of the lovely photography is credited to Brennan Smith.